These programs are hosted by the Center for Dermal Research, at the Life Sciences Building, Rutgers Busch Campus. Each is free with registration- Join us 12:30-2:30 (presentation 1-2). We’ll send driving directions and a parking pass in advance- GPS will get you lost! The Basic&Applied Dermatology Forum was founded in 1995 by Otto Mills, PhD, FCP, Adjunct Professor of Dermatology at the Robert Wood Johnson Medical School. 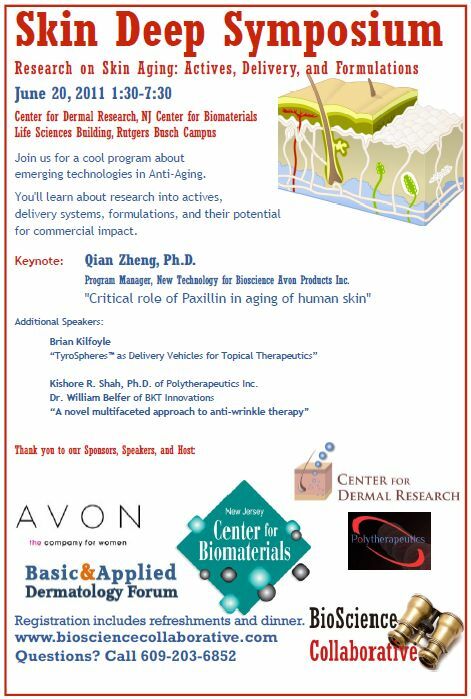 This ongoing series provides a platform for presentations by academic and commercial researchers, as well as practicing dermatologists, product developers, and licensing professionals. Research techniques and capabilities are constantly expanding. Join us to learn about breakthroughs in imaging, in vitro and in vivo models, and sensors with new and significant sensitivities.